Solo. BAM! Theorem 720. BAM! Now, BAM! DUET, a portable headphone amp with no DAC strings attached. It’s one of those handy few do-alls that does all like nobody’s business. BAM! For better and worse, the DUET shares much of the same design DNA as its AlgoRhythm Solo DAC line as well as the ALO Rx MKIII-B+. Obviously, the latter two are competing for the same market space. Both array Kubicon balanced and single-ended inputs across the back and outputs across the front. Gain control and volume pots in both amps are roughly in the same place. DUET’s first noticeable improvement is its front panel, which is less congested than the Rx chassis, which sports the necessities: SE out, balanced out, gain stage, and combined power/volume pot. No more, no less. It is somewhat busy, but is manageable. No cable will get in the way of any control. 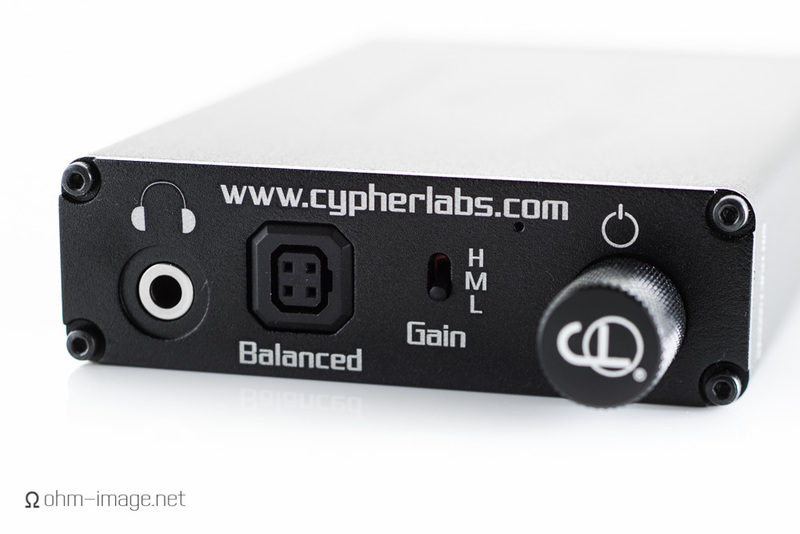 Would it be possible for Cypher Labs to separate its single and balanced ins/outs to opposite sides of the amp? That would allow same-face usage and allow safe pocket play, obviating dangerous back-end bumps. There is room for it. Ω is absolutely sure that the DUET’s single biggest design improvement is its use of a micro-USB charging port, which obviates the need for carrying multiple charging adapters. Take a single USB wall wart and you’re set for your smartphone, tablet, and portable headphone amp. Brilliant. DUET and Rx also share similarly excellent low gain circuits, which make earphone use über sweet. Sharing a case similar to its forebears and to ALO’s Rx series is a good thing. There is little flex in the aluminium chassis; hard-sunk bays house fastening hardware; every port is supported by walls of 2mm thick aluminium. I’m no fontist, but Cypher Labs’ use of non-helvetica for interface elements and logos is both refreshingly creative and a nod to the brand itself. Amp makers should design their equipment to stand out, not to fit in. Next to the Vorzüge PURE II, Cypher Labs simple traditional gain switch layout is meditatively simple: L, M, H- in that order. No memorising clever gain paths where middle means high and high means middle. The case itself is well suited to rough play. Its detail paint job fends off scratches well, but I still suggest wrapping it with an open-at-both-ends iPod sock, or something. Which brings me to the LED, which is perfect. It’s got that small science-fiction look to it, which almost begs for more beside it. Not too bright, not too dim. Surely better than Vorzüge’s ridiculous blinding light. In terms of good, industrial design, DUET is pretty much at the top of the heap. It is large, but it fits its siblings and spends time in cultivating a familial profile that only strengthens the brand image. Well done. DUET redefines what is possible in an all-in headphone amp. First and foremost, it sports a noise floor several orders lower than the Theorem 720 or Rx MKIII-B+. There is a slightly higher amount of noise in the signal than the Vorzüge PURE II, but not by a meaningful amount. This allows the new gain section to stretch its legs with both low impedance, high-sensitivity, high-current earphones, and low-current, high-impedance headphones. Low-gain amping is well-tailored for IEM usage. At the smallest volume values, left/right skew is minimal. Normal listening volumes should rectify small aberrations to achieve 95-98% channel balance. Bat-eared humans may prefer the slightly more accurate PURE II and Rx MK-B+ gain stages, but not by a huge margin. In terms of sound signature, DUET puts out a seemingly darker sound than the 720. In reality, both measure ruler-flat whether irrespective the load they drive. DUET’s stereo separation is leagues ahead of the 720 no matter the load. The wider bit comes from the usual psychoacoustic haunts: closer stereo images are easier for the ear to relate to. Because DUET’s stereo image and depth are so very deep time and you may have a very hard time slipping back to Theorem. To some, the Rx may sound even more swimmingly wide than either DUET or Theorem 720. That’s the nature of psychoacoustics. The ear hears what it wants to hear. But DUET pulls well ahead of both amps in almost every single benchmark. What you hear is smooth, clear transitions from bass to mids, a slightly soft high frequency range, and a wide, yet imaginable 3D stereo image. If you are a fan of the Vorzüge blush, you will be a fan of DUET. The same wonderful aroma is there in spades; it is a sound that will grow on you. Detail bubbles out of the incredible midrange 3D stage. Details easily lost in the fray: the wetness of a singer’s lips, the grating of skin against steel strings- are easily delineated from the background. Given time, DUET will add depth and atmosphere to that simple jazz ensemble. If you have a headphone that benefits from a balanced signal, you will gain a few decibels of stereo and better low-mid transitions. There’s not a headphone out there that causes DUET to stumble or cough. Sizzle and pop are obviated at all but the most ridiculous volumes under excessively current-hungry headphones. And even then, it’s your hearing about which you should be most worried. DUET is destined to be the product that defines Cypher Labs in the analogue arena. It stands up to both the PURE II and the Rx MKIII-B+ in almost every benchmark. Where it betters its peers: in noise floor and stereo performance (Rx); in connection options and high-voltage scaling (PURE II), it truly distinguishes itself. I don’t expect the enthusiast world will soon find an amp that can boast as much. BAM! This is the real McCoy.